US Ambassador to India, Kenneth I. Juster visited YouthNet’s ‘Made in Nagaland’ Centre in Kohima on Saturday. According to information, he was greatly impressed by the Centre and the various products by local entrepreneurs, which are on display. Ambassador to India, Kenneth I Juster, is in Kohima, to attend the Hornbill Festival 2018. He has been invited to the festival as the guest of honour. US Ambassador to India Juster, arrived in Nagaland on Friday. He was given a warm welcome by Nagaland Chief Minister Neiphiu Rio. US Ambassador to India, Kenneth I. Juster, arrived in #Nagaland today. He was given a warm welcome by CM Shri. Neiphiu Rio. 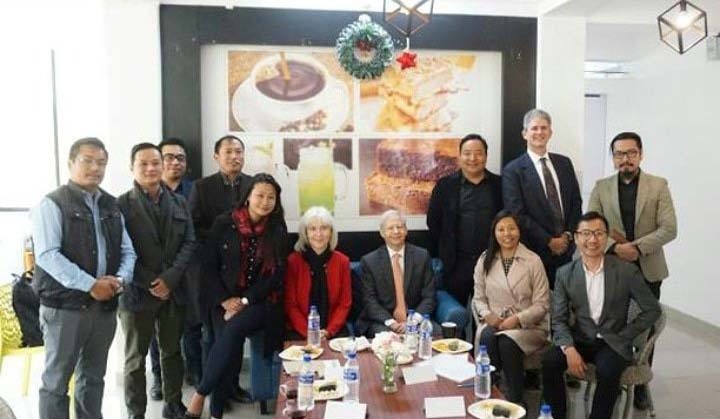 Earlier, Ambassador of the United States of America to India, Juster, who reached Imphal, the State capital of Manipur, recently, said that enhancing relationship with the northeastern region of India, particularly Manipuris, is critical to broaden connectivity within South Asia. Juster reached Imphal on Thursday evening on a two-day visit to attend the Manipur Sangai Festival. The American Ambassador was accompanied by Patricia L Hoffman US Consulate General, Kolkata.